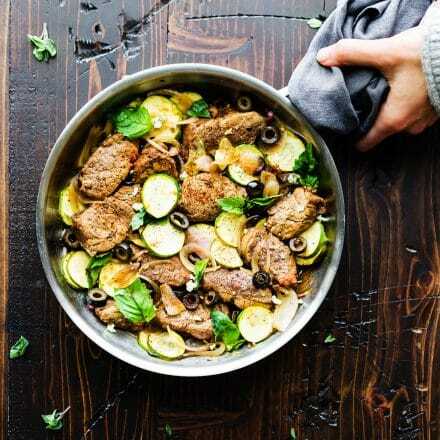 Mediterranean Marinated Balsamic Pork Loin Skillet with vegetables makes for an easy one pan meal! 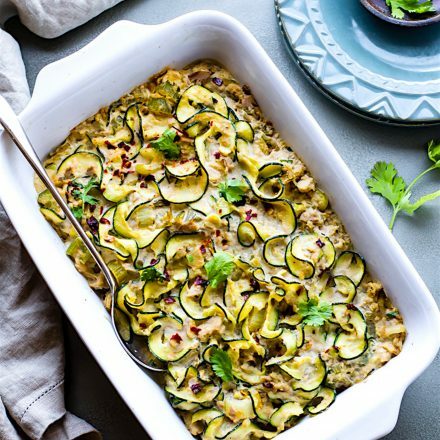 Veggie Packed, Nourishing, Paleo, low carb, and ready 45 minutes. You and your family will love this flavorful pork loin skillet dish in a tangy balsamic marinade. Skillet meals are a mom’s best friend! Yes, an almighty super easy pork loin skillet recipe. But first, let’s take a walk down memory lane again. Mmm k? Just like the childhood cereal throw back recipe, I think we all have a childhood dinner we grew up on. Especially the skillet meals. You know, hamburger helper or cheeseburger mac and cheese. Dang, I can just taste those now. Although I rarely got much. My three brothers would inhale it all before I even sat down at the table. Well, not much hasn’t changed here. My husband does quite the same. Unless I give him wine beforehand. Shhh… don’t tell hum my trick. Haha! Anyway, despite my attempts to have a “slow” skillet dinner, I’m still happy to watch him inhale it. The man (aka the kiwi) did not have pork loin or skillet dinners growing up in New Zealand. Nope. It was beans on toast, spaghetti on toast (it’s a thing), sausage rolls, or mince meat pies. Oh and Lamb! When I showed him just how easy it is to cook pork loin (which has similar texture to lamb loin) in the skillet, he was quite impressed. I was trying to be like … “So this would be an easy low carb skillet meal for when I’m out of town” kind of nudge. Did I mention he goes in spurts of wanting to eat low carb/ high fat? Ya, so there’s that. I guess that means more cookie cereal for me. But I digress. You know this. 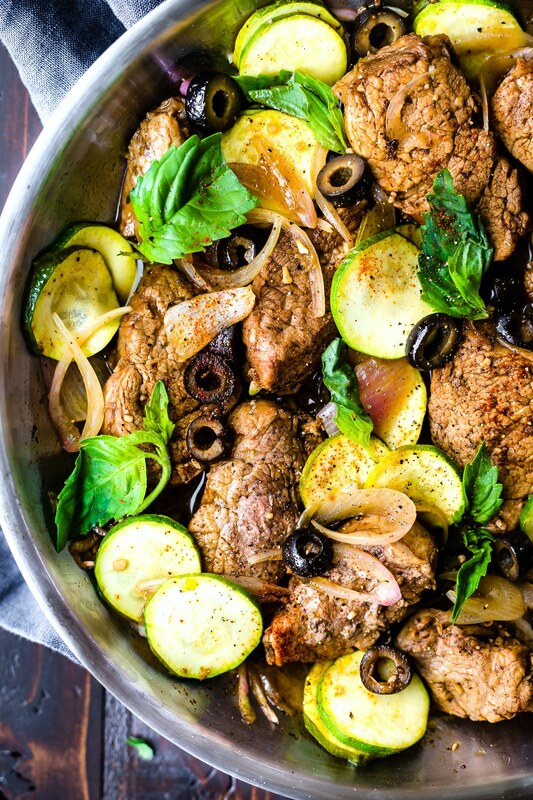 Let’s get back to the Mediterranean Marinated Balsamic Pork Loin Skillet. 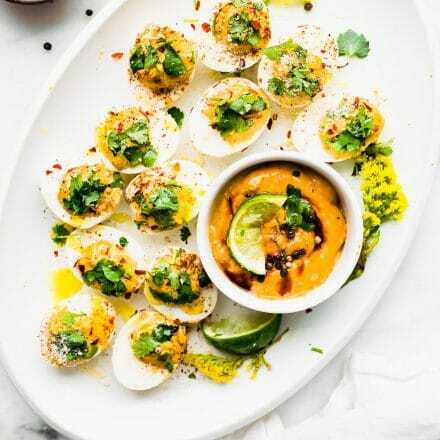 Now that you know that this dish has the ease of a one pot wonder and meal prep friendly, let’s talk about those flavahhhhh! . Mediterranean flavors that feel so sophisticated. What I like to call “fake your way fancy” winner of a dinner. err… Balsamic Pork Loin Skillet DINNER. Basil, Zucchini, sautéed onion, olives, herbs, and marinated Balsamic Pork Loin. Key being that marinated Balsamic Pork Loin. Simplicity at it’s finest. 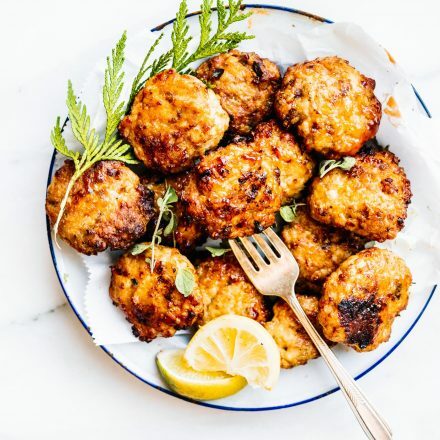 The Gluten Free Nutrition Specialist in me get’s excited because this dish is naturally gluten free and balanced! Veggies, protein, and healthy unsaturated fats. You’re welcome! The Foodie in me thinks “Oh a glass of Pinot Noir would be heavenly with this Balsamic Marinade.” The Thrifty Wife/woman in me is giddy because this pork loin skillet is awesome for make ahead lunches and meal prep. Just throw over white rice or potatoes and BANG… Carbs make it more! Speaking of meal prep, my Meal Prep Lovely ladies are back to share their favorite Gluten Free one pan Skillet meals! Healthy, flavorful, unreal easy to make! There just so happens to be a healthier grown up version of hamburger helper included. The inner child in me squeals for that! Okay, I’m done being corny. Let’s get the rest of these skillet dinners so you can plan the weekend. Take notes, come hungry! 3. Mediterranean Marinated PORK LOIN SKILLET oh yea! Paleo, whole 30 friendly, meal prep friendly (just add carbs like rice), and all that JAZZ! Did you take notes? Good! I hope you try them all! And saved room for this pork loin skillet. It won’t take up much time. Ready? 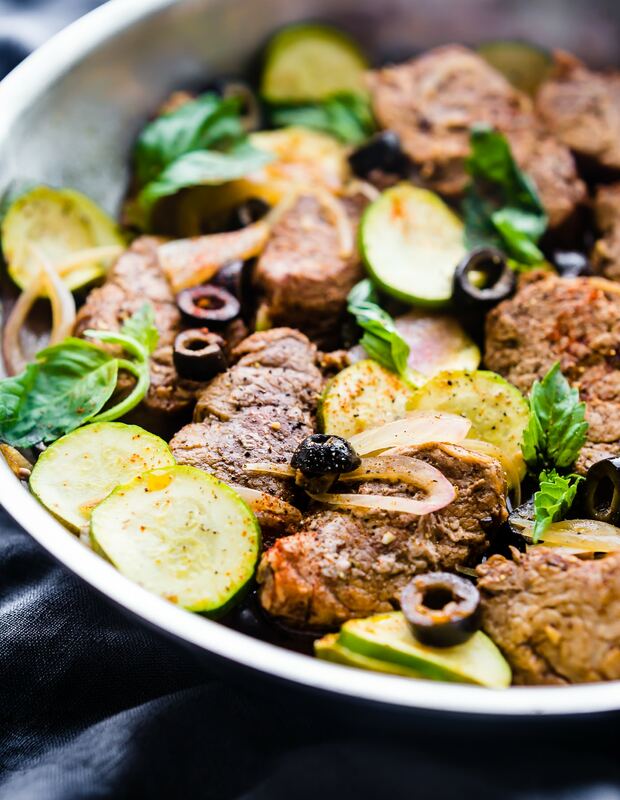 Enjoy this balsamic pork recipe! 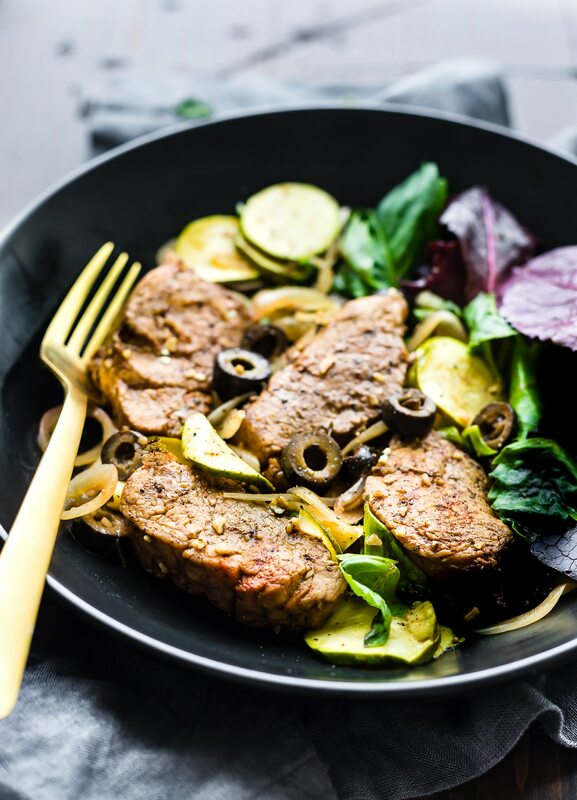 Mediterranean Marinated Balsamic Pork Loin Skillet with vegetables makes for an easy one pan meal! Veggie packed, nourishing, paleo, low carb, and ready to eat in 45 minutes. First slice the pork. Place in a ziplock bag inside of a large container. Whisk together the balsamic marinade ingredients and add to pork loin slices. While pork is marinating, slice your veggies. Once marinated, remove and prepare your skillet. Heat skillet on medium heat. Sauté onion first until fragrant. No oil needed. Next add pork loin strips and the remaining marinade sauce. Cook on medium for 5 minutes then flip over pork slices. Add in your olive and zucchini slices. Cook another 5-7 minutes or until pork is no longer pink. Plate your pork and vegetables. Serve w/sauce and marinade and top w/fresh basil. Add more paprika, salt, and pepper, if desired. This dish is great served with leafy salad. Feel free to add feta or even serve on top of rice or potatoes for extra starch. (It won’t be paleo). omit honey for whole 30 option. Dinner made easy and Fast! 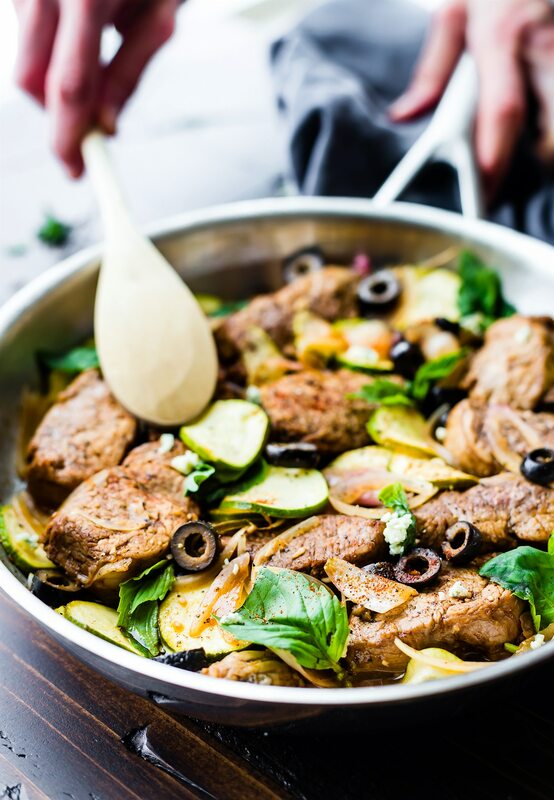 #Paleo Mediterranean Marinated PORK LOIN SKILLET. What was your favorite skillet meal growing up? Do you still try to make it today? Maybe a bit healthier or fresh? We’ll be having something similar tonight! That pork that I made on Valentines Day just keeps on giving! I love pork loin and ANYTHING balsamic! Can I come for dinner?! 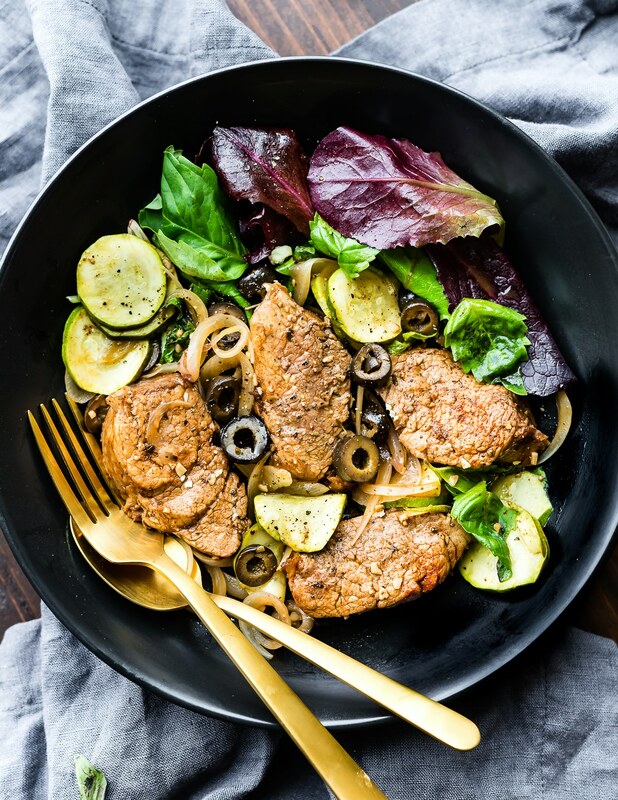 I love the idea of flavoring pork with a balsamic marinade – so brilliant and so easy to whip out any night of the week! Skillet meals are my jam, especially on busy weeknights…I could do some serious damage to all of those one skillet meals! OMG i was just leaving a comment on your curried lentil post. Were our ears burning? Haha! yay for skillets! I’m always looking for new pork recipes and this will be my next dish. You know I’m always down for one skillet meals! This is such a beautiful skillet meal. Loving all the flavors! All those deilicious flavors are making me want to try this for sure! I love skillet recipes! This looks delish! I love the other skillet recipes as well! One skillet dinners are my absolute favorite and the flavors in this one are calling to me. Especially the olives. Delicious! Hahaha…its true skillets aren’t really a thing down here in NZ . And we are a tad weird by loving our spaghetti on toast…but it is so good . But I have a feeling it won’t even compare to the greatness of this dish though. I mean balsamic pork…yum. OMG i love that you know this Kylie! Next up, balsamic Lamb Loin skillet for YOU! So healthy and so delicious! 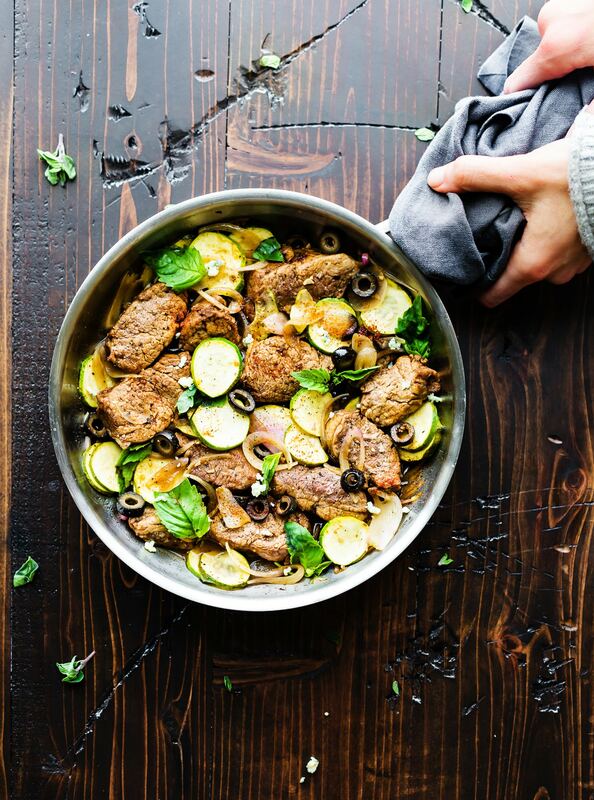 I love one skillet meals, and I’m always looking for new ways to use pork. Looks perfect! Please come make me dinner!!!!!! This looks so good. let’s make dinner for each other! I think pork gets a bad wrap but I grew up on it. Pork loin IS AWESOME! And olives. always! This looks so good! The olives and basil would add so much flavor! I always love balsamic marinades. So tasty and so damn easy! Also, pork is underrated in skillet meals, loving how you used it here! I am loving all things Mediterranean everything right now! Can’t wait to make this! 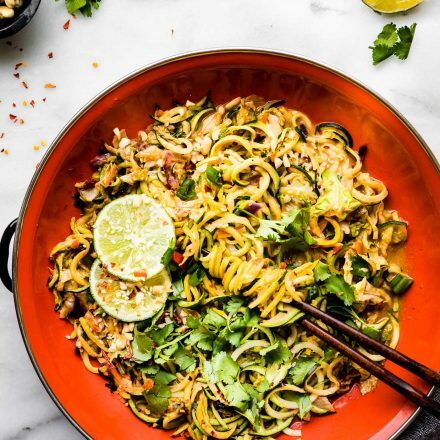 Looks perfect for whole 30!